Placing things into orbit is something humanity has been doing since the 1940’s, beginning with Germany’s V2 Rockets, then giving way to artificial satellites like Sputnik in the 1950’s. These efforts really came into their own during the 1960’s and since, when manned missions reached high orbit and even the Moon. But despite all these milestones, little has been done to address the problems of cost. Ever since space travel began in earnest, the only way to send satellites, supplies and shuttle craft into orbit has been with rockets. Even at its cheapest, a space launch can still cost an estimated $2000 per pound per mission, due to the fact that the rockets employed are either destroyed or rendered unusable once they’ve completed their mission. Attempts to create reusable launch systems, like the SpaceX Grasshopper, is one solution. But another involves “slinging” payloads into orbit, rather than launching them. 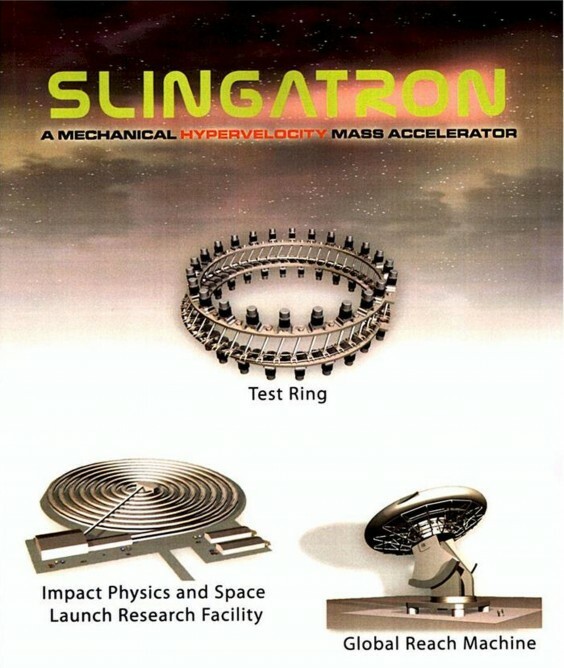 That’s what HyperV Technologies Corp. of Chantilly, Virginia is hoping to achieve with their design for a “mechanical hypervelocity mass accelerator”, otherwise known as a “slingatron”. Invented by Derek Tidman in the 1990s, the slingatron replaces rockets with a more sophisticated version of the sling. However, the principle differs somewhat in that the device uses something far more sophisticated than circumferential force. In the end, the name cyclotron might be more apt, which is a very simple particle accelerator. 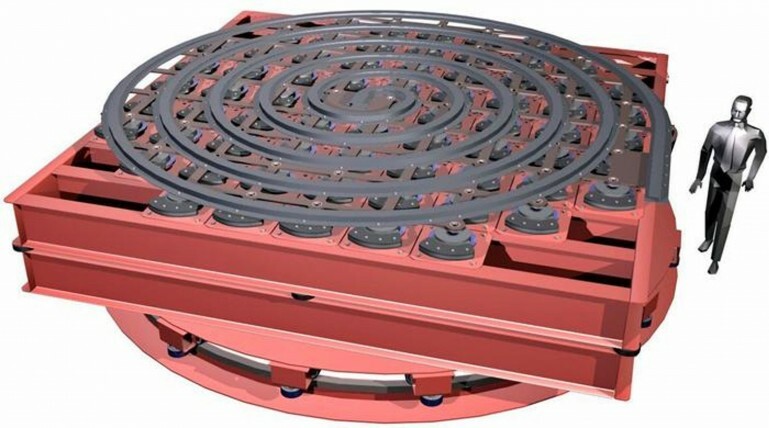 Utilizing a vacuum tube and a series of magnetic/electostatic plates of opposing charges, an atomic particle (such as a proton) is introduced and sent back and forth as the polarity of the plates are flipped. 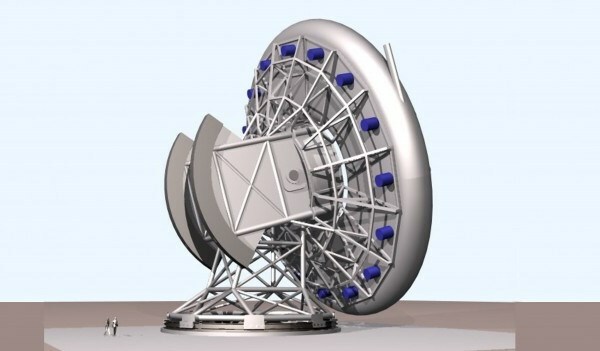 As the frequency of the flipping is increased, the proton moved faster and faster in a series of spirals until it reaches the rim and shoots out a window at extremely high velocity. The slingatron achieves the same result, but instead uses a spiral tube which gyrate on a series of flywheels along its length. As the slingatron gyrates, a projectile is introduced and the centripetal force pulls the projectile along. As the projectile slides through larger and larger turns of the spiral, the centripetal forces increase until the projectile shoots out the muzzle, traveling at several kilometers per second. 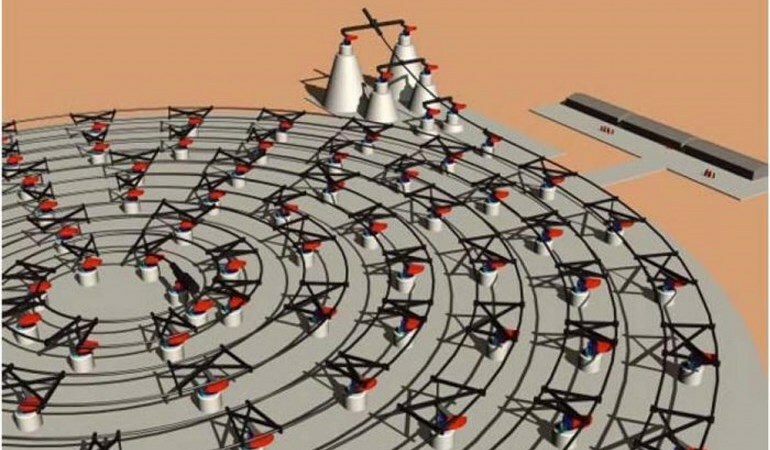 Ultimately, the goal here is to build a slingatron big enough to fire a projectile at velocities exceeding 7 km/s (25,000 km/h, 15,600 mph) to put it into orbit. With rapid turnarounds and thousands of launches per year while all of the launch system remains on Earth, the developers claim that the slingatron will offer lower costs for getting payloads into orbit. However, there are weaknesses to this idea as well. For starters, any projectile going into space will also need to be fitted a small set of rockets for final orbit insertion and corrections. In addition, the G-forces involved in such launches would be tremendous – up to 60,000 times the force of gravity – which means it would be useless for sending up manned missions. In the end, only the most solid state and hardened of satellites would have a chance of survival. The developers say that a larger slingatron would reduce the forces, but even with a reduction by a factor of 10,000, it would still be restricted to very robust cargoes. This makes it an attractive options for sending supplies into space, but not much else. Still, given the costs associated with keeping the ISS supplied, and ensuring that future settlements in space have all the goods and equipment they need, a series of slingatrons may be a very viable solution in the not-to-distant future. Combined with concepts like the space penetrator, which fired bullet-like spaceships into space, the cost associated with space travel may be dropping substantially in coming decades.